Duchess Kate had all eyes on her as she stepped out at BAFTAs last night accompanied by her handsome husband. Lovely Kate Middleton keeps on conquering her fans’ hearts with her gorgeous outfit choices every time she steps out in public. 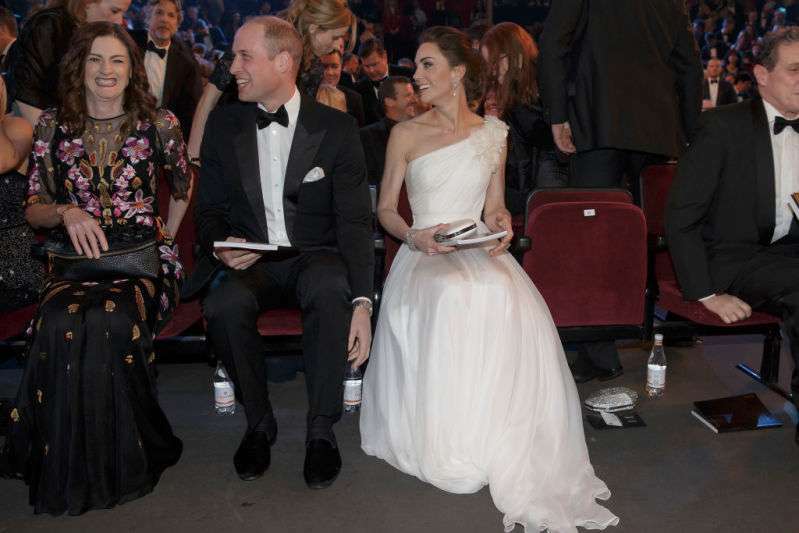 On Sunday, the Duke and Duchess of Cambridge attended the British Academy Film Awards (BAFTAs). As you know, William is BAFTAs’ President. He also was one of the presenters at yesterday’s ceremony. Fans couldn’t take their eyes off the stunning couple as William and Kate arrived all smiles holding hands. Duchess Kate resembled a real angel in her stunning full-length white shimmering one-shouldered dress by one of her favor ite fashion designers, Alexander McQueen. Catherine accessorized her outfit with a matching clutch and a diamond bracelet. She also wore gorgeous pearl earrings, which reportedly belonged to the late Princess Diana. Prince William looked handsome as always in a black tuxedo. Fans admired the couple’s appearance last night. It’s cute how William and Kate both talk the same way with their hands. They both did that in video clips at the BAFTA’s. Last year, Duchess Kate also looked exceptionally beautiful at the BAFTAs ceremony. She wore a splendid green Jenny Packham gown with black details. As usual, Duchess Kate proved her exceptional sense of style. Did you like Kate’s 'white angel’ gown at BAFTAs 2019?